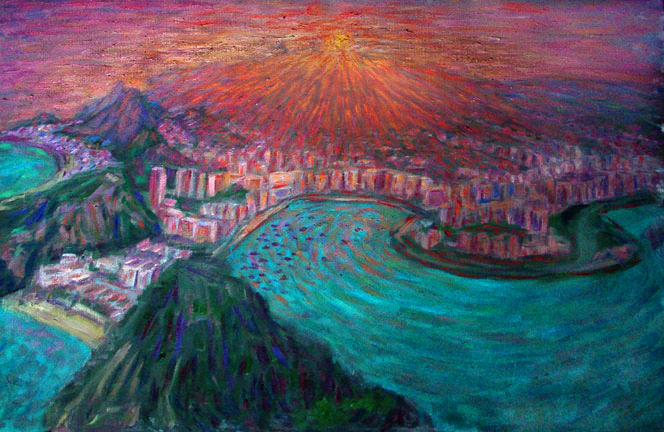 "Rio de Janeiro Sunset From Sugarloaf"
During my days in Rio I took a tour of the city that took me to Sugarloaf, where I saw one of the most spectacular sunsets of my life. The tram that got us to the top took us over this smaller mountain, which I decided to put in the painting to give some perspective from the top to Guanabara Bay, with Cidade Marveloso nestled into the foot of the mountains. The buildings are predominantly white, and the fiery sunset lights lit up the mountains and city below. Notice how the orange rays melt into the violets, blues, and vermilions of the city, against the Manganese color of the Bay, and the strong blues and greens of the foreground mountain. PaulB's Pointillistic/Impressionist original oil paintings of Brazil and various prints and poster formats of a wide variety of subject matter by the Pointillistic/Impressionist oil painter from landscape/waterscape paintings, dance, sports, portrait, to classical figures, flowers, rock and roll, Brazil, and Hawaii paintings and prints are available for purchase for as little as $24.95 for an 8" x 10" matted print on photo pape. Pointillistic/Impressionist Giclee prints of Brazil on real canvas or heavy watercolor paper are available. One of a kind Brazil embellished prints, which are Giclee prints retouched in genuine oil paint by PaulB. Unless noted PaulB's original Pointillistic/Impressionist oil paintiings are oil on canvas. Paul Berenson's pointillistic/Impressionist oil paintings are in privale collections around the world, including the downtown Los Angeles Athletic Club and have appeared in numerous publications, including the New York Philharmonic Playbill. PaulB.com also builds websites and PaulB is a member of the LA Web Professionals Group.